Stephen mentioned in passing that he was considering taking a break from his wheat-free diet as he was craving bread. As a confirmed bread-lover, I’ve missed homemade pizza the most since Stephen’s experiment started so, seconds after he admitted his resolve was weakening, I’d convinced him we should eat pizza for dinner. We had rather a lot of salami and mozarella left over from a previous sandwich-making extravaganza (which was brilliant but I forgot to photograph so watch out for that soon) so that was the starting point for this pizza. At the last minute, Stephen threw on some artichokes which are perfect for this sort of thing and so useful to have in the fridge. After a brief searing in the oven, the pizza was topped with some watercress which I’d tossed in some pesto and some fresh mozarella (a tip we picked up at a Pizza Express Masterclass). Stephen thought this was a good pizza but not as good as last time, I thought it was brilliant though. The watercress adds a great pepperiness to the pizza and the fresh cheese is a great contrast to the cooked, stringy mozarella which makes the whole thing seem lighter and fresher. 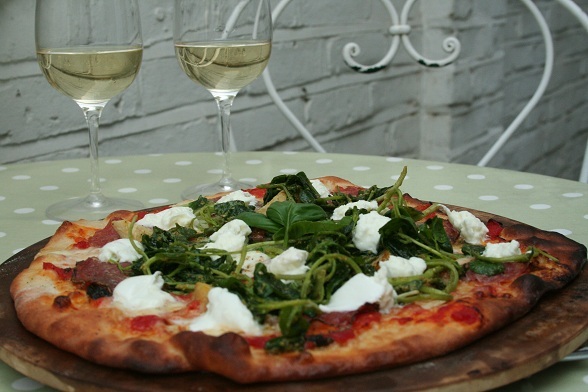 Subscribe to comments with RSS	or TrackBack to 'Salami, Pesto and Watercress Pizza'. It looks wonderful Kerri. I am so jealous of your outside space too. Have you tried sourdough bases? You could go half wheat and half rye and the sourdough is gentler than using yeast. Lots of wheat and yeast sensitivites are linked to each other so it may be worth experimenting. .-= Helen´s last blog ..Get a Wordle In! =-. Thanks, Helen. Our garden is really small but it makes such a difference to have some outside space, especially at this time of year. I haven’t tried a sourdough base. My starter met with a rather unfortunate end and I haven’t attempted another. It’s a very good idea though and something I will try at some point. You are welcome to some of my starter. It is so active it overflowed today! Ooh, I’ll be in touch. You’ll have to give me some tips though otherwise the yeasty equivalent of Social Services will be after me! Huh. Never had watercress on pizza before. Was it wilted or raw? .-= Nate @ House of Annie´s last blog ..Dim Sum @ Noble House, Singapore =-. It was raw but I dressed it with the pesto a little too early which meant it became wiltier than I planned. The pepperyness still came through, it just wasn’t as crunchy as I would have liked.